PBS documentary show Frontline features Alison Klayman’s work filming Chinese artist Ai Weiwei’s tumultuous past two years. The journalist has followed Ai through art exhibitions and political scandals alike, interviewing the artist and his family as well as the Chinese artistic community in a powerful portrait of one of the world’s most striking artistic figures. 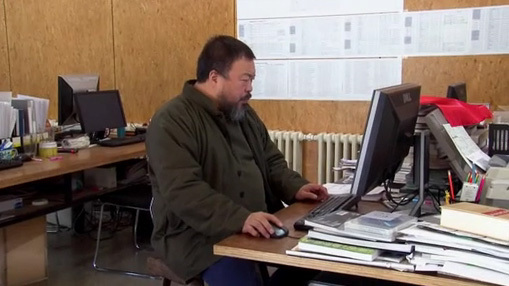 See the Frontline video, entitled Who’s Afraid of Ai Weiwei, below. The 17 minute film includes documentation of Ai’s major exhibition So Sorry at Munich’s Haus der Kunst, his studios in the Beijing suburb of Caochangdi and the artist’s reaction to his beating by Chinese policemen in Sichuan following a contentious court case. The episode ends with the destruction of Ai Weiwei’s studio in Shanghai. On Frontline‘s website, also check out the uncut interview with The New Yorker‘s China correspondent Evan Osnos about Ai Weiwei, as well as a look at the filming process with Klayman. Fortunately, the Frontline footage is just the beginning of Klayman’s project. She is in the process of editing together a full-length documentary called Ai Weiwei: Never Sorry. Through Kickstarter, Klayman is hoping to raise $20,000 to produce the film by Friday, May 27. As is clear from the Frontline teaser, this documentary will not only be an important exploration of an internationally famous artist’s career, it will also be politically and socially relevant. Klayman is documenting a momentous time in contemporary Chinese history, and showing us a behind-the-scenes view that could not otherwise come to light. I’d encourage anyone who wants to support this independent voice in the art world to donate. Plus, the tote bag looks awesome. According to Artforum, Ai is building a studio complex in Berlin. The studio would provide an emergency haven should the political environment in China become too dangerous. The article points out the cancellation of Ai’s major exhibition at Beijing’s UCCA museum.